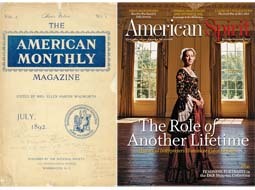 Now, DAR members can access 118 years’ worth of DAR Magazine publications online via the new Digital Magazine Archive! This monumental repository, including issues spanning from 1892 to 2010, is available on the Members’ Website. Members can also reach the Digital Magazine Archive through the DAR Magazine Committee website and the Magazine and Newsletter section of the Members’ Website. We are excited to add this new resource to the growing collection of digitized NSDAR reference materials, made possible by the President General’s Project, which funded the installation of fiber optic cable to increase the National Society’s Internet bandwidth. Last fall, Magazine Office staff compiled a complete set of DAR Magazine publications. The collection was sent out to a scanning company, which transformed more than a dozen boxes full of bound magazines, plus a few microfilms, into hundreds of thousands of digital images. After the Information Systems Department organized and formatted them, these became the Digital Magazine Archive. This tremendous resource detailing our organization’s history includes a wealth of information, and its applications are endless. Use it to research a historic or commemorative marker placed long ago, to find out how various chapters contributed to World War II relief, or, as our President General did, to determine the given names of officers identified elsewhere only by their husbands’ names. Allow accounts of the work of earlier Daughters to fuel reflection and inspiration, especially as the National Society, state societies and chapters around the world plan to celebrate the 125th anniversary of NSDAR. 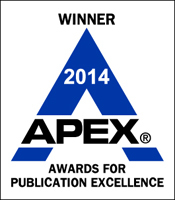 Currently, there is no searchable online index for the Digital Magazine Archive. As we investigate several possible indexing options, one factor that will guide our decision-making is the level of interest members show in this online archive. Page view statistics will be a key indicator for us, so if you are excited about this new digital reference please let us know by visiting and exploring the site. Of more than 2,000 entries judged in the completion, only 100 were honored with a Grand Award. American Spirit is proud to be part of that exclusive group, and we’re especially thrilled to be recognized for an issue that included several articles with DAR connections. 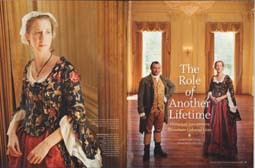 Nancy Mann Jackson’s cover story “The Role of Another Lifetime” highlighted DAR members and others who bring history to life for modern-day audiences. In an article titled “Changing Faces,” DAR Museum Curator Olive Graffam showcased 11 feminine portraits from the Museum collection and traced the evolution of female portraiture from the mid-18th to the mid-19th century. And the Historic Homes department visited Belmont Hall in Smyrna, Del., which once was home of early Delaware State Regent Caroline Elizabeth Cloak Peterson Speakman.